Maggie Miller, a school counselor at both DeWitt High School and Okemos High School, was known for her passion for life and the profession. She was the kind of counselor who invited both students and colleagues into her heart, her office, and her home. For Maggie, this work was about people, first and foremost. In 2005 Maggie was stricken with ALS. 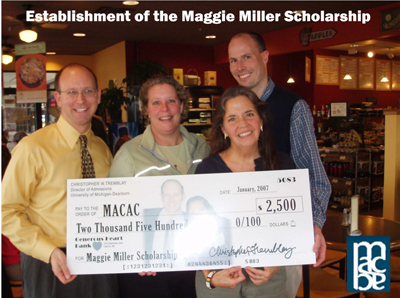 In 2007, Christopher Tremblay donated funds to establish the Maggie Miller Scholarship through MACAC to honor Maggie's contributions to our field. Maggie passed away in November 2008. If the college the student plans to attend is not on this list, it would be advisable to contact the college to determine if it is a member of a NACAC affiliate in another region. Documents may be sent as a pdf to kjbryant@umich.edu or mailed to the above address. ALL DOCUMENTS AND/OR VIDEO MUST BE RECEIVED BY APRIL 7, 2019. Make a difference...join the 2019 scholarship committee or make a contribution to the Maggie Miller Scholarship Fund.